The usual summer gas hikes have yet to materialize this year. But when they do, we’ll all be thinking how good the Amish must have it, right? 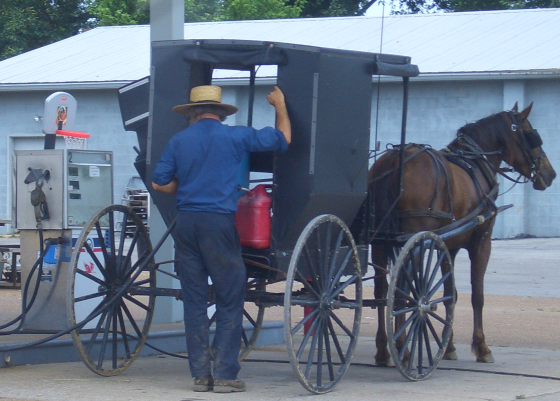 This shot from the Ethridge, Tennessee community is a little reminder that Amish use fossil fuels too. It’s been a little light on blogging lately because I have been doing a lot of behind-the-scenes work on the blog. The blog will still be here but Amish America will be expanding in scope with some new additions that I hope will add a lot to the site experience. More to come. Looking forward to see what you do with your blog. I bet that can of gas lasts all summer. Right, he’s probably not pulling over once a day. Reminds me of the time we visited Indiana and saw an Amish buggy going through the drive thru at a McDonald’s! We savor the memory and laugh about it! Erik, thanks for a great blog–will look forward to whatever changes come. I like those types of dichotomies. I once saw a sign at a blacksmith shop in or near Mercer County, PA (forget which Amish community it was in) that said “Horseshoer and Authorized Honda dealer”. I’ve been wondering about that combination for years now. Great shot 🙂 Looking forward to seeing the site changes. Reminds me of a picture I saw of a donkey with saddle bags on that had gas jugs in them. Quite a sight to see the donkeys pulled up to the pump! I can’t wait to see the changes! This website is probably the most enjoyable of all the sites I visit daily. I subscribe to a boatload of email newsletters and probably spend the most time at the Amish America site. Thank you Randy! 🙂 Made my day.